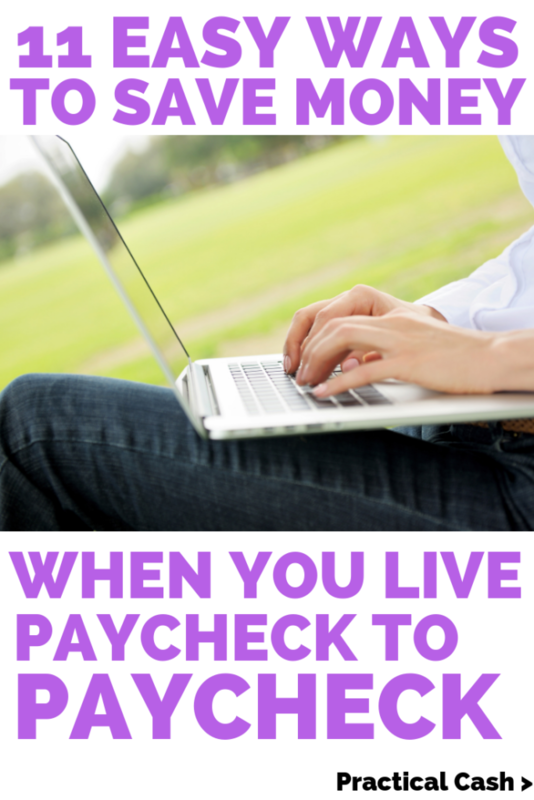 When you’re living paycheck to paycheck, just getting the bills paid every month can be challenging. It may feel like you’re never going to get ahead, let alone accumulate any meaningful amount of savings. Here are 11 tips to save more money when you’re living paycheck to paycheck. What did you do to break out of the paycheck to paycheck cycle? Leave us a comment below! How much of an emergency fund would it take for you to sleep well at night? It’s often recommended that you build 3 to 6 months of cash savings to stop living paycheck to paycheck. But the amount you need is highly individual. If you have a volatile career that has a high likelihood of being laid off or if you foresee a financial emergency in your future, you may want the goal of more than 6 months expenses stashed away. People who write down their goals are more likely to achieve them. So take a minute to write out your financial goals for getting out of the paycheck to paycheck cycle, like saving $1000 in an emergency fund or put aside 3 months of household expenses in cash. Because living paycheck to paycheck can be discouraging, successfully saving money while things are tight is a matter of positive thinking. When you’re trying to save money on a tight budget, you may be scared of going broke or being homeless. You might see money as scarce or fleeting. You might even spend extra money because it’s precious – and you don’t want bill collectors or credit card companies to get the money you’ve worked so hard for. Improving your money mindset is a key way to break the paycheck to paycheck cycle and start saving money. You can get a free list of money affirmations you can use to start thinking about money positively and bringing abundance into your life by clicking here. 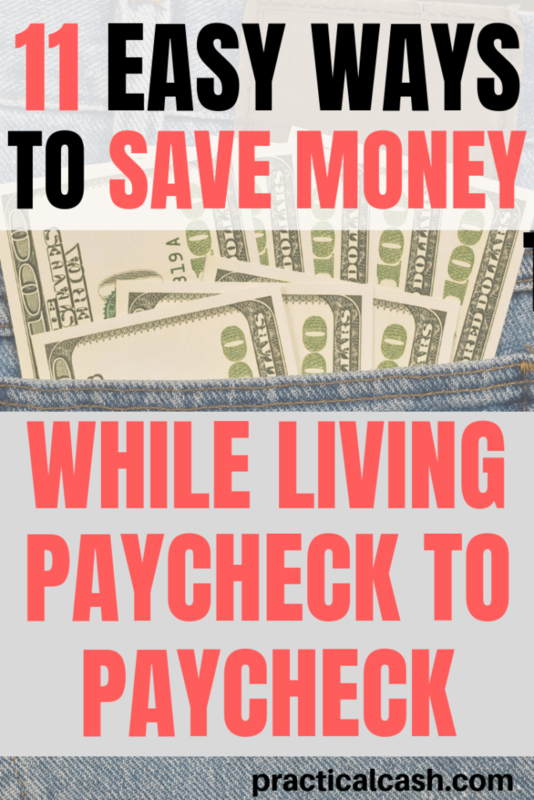 To save money when living paycheck to paycheck, find an amount of money you KNOW you can save – it might be as little as $5 per week or $1 a day – and automatically have that sent to a savings account. You can do this easily online. Simply find an online bank (Ally Bank or Capital One are two reputable ones that don’t require high balances) and open a savings account. Now link your checking account. Have your savings goal (remember, start small with an amount that you are certain you can cover every month) and have the amount automatically deposited to your new savings. The key to success with this habit is to pretend that you don’t have that money to spend. Try to forget the account is even there. It’ll just slowly and easily accumulate over time. If it seems hard to find hundreds each month to add to your savings account, try a new method called microinvesting. One way to find cash for savings is to reduce your monthly expenses, then divert the savings to your new emergency fund account. Studies have shown that people spend less when they hand over bills to pay. The inconvenience of cash can actually be very useful for anyone trying to save money while living paycheck to paycheck! Paying for your food and entertainment with cash (you can use envelopes in your wallet or purse to keep the spending categories separate) is a handy way to keep your budget on track. Spending less because you’re using cash can free up money to put in your savings account when you’re living paycheck to paycheck. Using coupons at the grocery store (try to get them free from friends or family who get the paper or find them online) can save you money on groceries. Spend a little time each week searching for coupon savings. Make sure you’re using a coupon app like Ibotta to get money back from every grocery trip. The trick here is to actually direct your coupon savings to your bank account. Every time you get home from the grocery store, check your receipt. It should tell you how much you saved with coupons that shopping trip. Now transfer that amount right into your savings account so you don’t “lose” your coupon savings. Create a buffer in your paycheck to paycheck budget by delaying purchases and services. Do you normally replace things as soon as they break or before? Try going without to see if you even have to spend the money on it. Another strategy is to slightly delay the services you use. If you get your hair cut every four weeks, try extending that out to six weeks instead. In a year’s time, if you spend $30 per hair cut, you’ll only have spent $210 to have your hair cut – instead of $390. That extra $180 can be great padding to your emergency account. Bake a loaf of bread every week instead of buying. Change your own oil instead of taking it to a garage. Make a few Christmas gifts instead of buying them. Watch Youtube videos to do simple home repairs. One way to earn extra income that you can use to stop the paycheck to paycheck cycle is to start a hobby or business to make money. Finding a part-time job to pad your savings is one method. Continue to live on the income of your regular job, but put all of your part-time job money in your emergency fund savings. Or you might save all of the tips from your side hustle. Another way to earn extra income is to try some work from home side hustles. A lot of times these side hustles provide passive income that you can use to break out of the paycheck to paycheck cycle. This can be a great option because you can usually do it at night or on weekends, without taking time away from your regular job or family. Whatever money you earn can be a great start to your savings. You could try blogging for money, flipping items for profit online, or filling out class actions to get cash back. If you don’t have a home business in mind and your schedule doesn’t permit a part-time job, try taking some surveys. The great thing about taking surveys is that you can work as little or as much as you want and it fits great with a busy schedule of interviewing and looking for work. The way to earn the most money with surveys is to get hooked up with a variety of survey companies. That way you can always have surveys available to do. You can find out more about my favorite company, Survey Junkie, here. Finding things you need for free is a key strategy for how to live frugal and breaking the paycheck to paycheck cycle. If you need something – a tool, clothes for your toddler, help completing a tricky car repair – use the free method to cut the cost and put you further from avoiding living paycheck to paycheck. First, ask your network. Your friends, family, and coworkers may have the item you need just lying around and would be happy to lend it to you. Find out if you can get it with some extra labor. Maybe your friend would help you install a floor in your home for the cost of a home-cooked meal. Maybe instead of having firewood delivered for your wood stove, you can scour the Craigslist ads until you see an ad for free wood and go pick it up yourself. Every step you take to cut down your expenses will mean the more money you have available to save for unexpected emergencies. When you could comfortably miss a paycheck without missing any bills or meals, then you’re free from the trap of paycheck to paycheck.